In May 2013, the IRS seized more than $68,000 from Vocatura’s Bakery—a third-generation family business located in Norwich, Connecticut—because they claimed the owners violated so-called “structuring” laws by depositing cash in the bakery’s bank account in amounts less than $10,000. Three years later, the government still had the bakery’s money, although it had never brought its case before a judge, and was threatening to launch a sweeping investigation into practically every aspect of the business’s finances in an effort to find some retroactive justification for taking the money. The case was the ultimate example of the abusive law enforcement tactic of seizing first and questioning later—much later. In February 2016, a federal prosecutor demanded that two Vocatura brothers, David and Larry, plead guilty to criminal charges of “structuring” their bank deposits. Under the proposed plea, the brothers would have faced 3-4 years in prison and would have agreed to forfeit the initial $68,000 as well as an additional $160,000 in personal assets. Believing they had done nothing wrong, the Vocatura brothers refused to sign the plea. The federal prosecutor and the IRS retaliated by serving Vocatura’s Bakery with a wildly overbroad grand jury subpoena for practically every business record from the past eight years as part of a fishing expedition to retroactively justify the seizure. The IRS’s continued pursuit of the Vocaturas violated the agency’s own policies. After facing criticism over several high-profile abuses of the structuring laws to pursue civil forfeiture against innocent small-business owners, the IRS announced that it would only apply structuring laws to real criminals. The Justice Department adopted similar policy changes in March 2015. But those voluntary policy changes proved insufficient to stop the government from pursuing forfeitures based on so-called “structuring” of bank deposits. Instead, it appears that public outrage over the use of civil forfeiture pushed aggressive prosecutors to pursue threats of criminal sanctions. In May 2016, David and Larry teamed up with the Institute for Justice to demand that the government return all of the $68,382.22 seized from the bakery and end its profit-motivated fishing expedition into the bakery’s finances, as well as the government’s abuse of prosecutorial authority to pressure property owners to agree to forfeiture. Law enforcement should not be using the threat of jail time to fund its budgets. Hours after IJ filed its motion demanding the return of the bakery’s money, the IRS capitulated and agreed to return the money in full. The IRS initially stated that it was going forward with its retaliatory grand jury investigation, but just weeks later the IRS announced that it was withdrawing its subpoena as well. First, the IRS Took $68K From Connecticut Bakers. Now, It’s Investigating Them. IRS Returns Bakery’s Money After 3 Years. Now It Wants To Put The Owners In Prison. Vocatura’s Bakery was founded in 1919, almost one hundred years ago, and has been owned and operated by three generations of the Vocatura family. Originally founded in Westerly, Rhode Island, the bakery has been in its current location in Norwich, Connecticut, since 1956. The family has been baking bread in the same industrial-sized oven since the 1950s. The current owners of the business—David, Larry, Frankie and Richard Vocatura—grew up in the bakery. They tell stories about being pushed around the bakery in a hand truck, or crawling into the oven (while the heat was off, of course) and riding around on the baking trays as they circulated like the cars of a carousel. Today, David and Richard run the front of the house, Larry does the baking and Frankie drives the delivery truck. The family works around the clock to keep the bakery going: The baking is done almost entirely at night, and then the fresh bread is sold throughout the day. The bakery is a fixture in its community and wins awards and rave reviews for its grinder sandwiches and outstanding white pizza. On May 1, 2013, a group of at least eight armed IRS agents and a U.S. Marshal showed up without any advance warning at the bakery while David was working the front of the store. Additional agents went to the Vocaturas’ homes. David and Larry were questioned separately on the premises of the business: a group of four interrogated David on the bakery’s work floor, while another group of four took Larry to a closet-like office. Frankie, meanwhile, was questioned at his home, while Richard happened to be out of state and missed the raid entirely. From the start, the government conducted the case as a fishing expedition, searching for evidence of some form of illegal activity at the bakery. The agents asked Larry, David and Frankie questions about all manner of illegal activity, including whether they were selling drugs out of the delivery trucks, running a prostitution ring in the back of the bakery, or keeping guns on the premises. The agents, however, found no evidence of criminal activity during the raid—because there is no criminal activity occurring at the bakery. During the interrogation, the agents asked David (who makes the business’s weekly bank deposits) a series of questions about his banking practices. Was David aware that weekly cash deposits for the business were generally made in amounts under $10,000? Why was that? Did he know that cash deposits over $10,000 were reported to the federal government? Not understanding why the agents were asking these questions, David asked if he needed to speak to a lawyer, but the agents assured him he did not. At the conclusion of the interview, the agents finally explained that they had seized the bakery’s entire bank account, containing over $68,000. The IRS targeted Vocatura’s Bakery under so-called “structuring” laws, which make it a felony offense to avoid federal bank reporting requirements. Banks are required by federal law to report cash transactions over $10,000. And federal law also makes it a crime—structuring—to engage in transactions under $10,000 in order to avoid the filing of a report. These laws were intended to target drug dealers, money launderers and hardened criminals. But, as this very case demonstrates, they often sweep up legitimate businesses guilty of nothing more than doing business in cash. While the structuring laws make it a crime to limit the size of a deposit with a specific purpose to conceal information from the government, businesses can have all manner of innocent reasons for depositing cash in amounts under $10,000. In this case, a bank employee called the bakery in 2007 to complain that an over-$10,000 cash deposit had required the bank to complete additional paperwork. On the understanding that bank employees did not like having to deal with this paperwork, the bakery limited the size of its weekly deposits to help the bank reduce red tape. Because the business’s weekly cash revenue fluctuated above and below the $10,000 mark—and generally was below $10,000—it was a simple matter for the bakery to hold back cash to avoid going over that $10,000 threshold. No one at the bakery had any idea that these weekly bank deposits would lead the IRS to accuse Vocatura’s Bakery of a federal crime. The IRS has a clear financial incentive to apply the structuring laws broadly: The IRS can seize and forfeit entire bank accounts involved in structured transactions, and the IRS can then keep the money that it takes to fund its operations. Similarly, the federal prosecutor’s abuse of his criminal charging authority to attempt to pressure the Vocaturas to agree to the forfeiture highlights the broader problem of prosecutorial abuse that arises when there are financial incentives for prosecutors to be extremely aggressive in pursuing forfeitures. This is very different from the situation when the IRS conducts a standard tax audit. If the IRS concludes that a taxpayer has underpaid their taxes, any additional money paid by the taxpayer goes to the government’s general fund. Those funds can then be appropriated by Congress and almost certainly will not be available for use by the IRS. Forfeiture laws allow the IRS and other federal agencies to make an end-run around Congress’s control over federal appropriations. Under federal forfeiture statutes, money seized and forfeited by a federal law enforcement agency is deposited in a special dedicated fund and thereafter is available to the agency to fund its budget without having to go to Congress to ask for additional funds. This ability to circumvent the usual budgeting process creates a very powerful financial incentive for any federal law enforcement agency to engage in forfeiture. Indeed, Vocatura’s Bakery is among many legitimate businesses targeted by the IRS under the structuring laws. In other cases handled by the Institute for Justice, the government seized more than $60,000 from a dairy farm in Maryland, more than $100,00 from two different convenience store owners in North Carolina, more than $35,000 from the owners of a supermarket in Michigan, more than $32,000 from the owner of a small-town restaurant in Iowa and more than $446,000 from three brothers who operate a business distributing candy, food and cigarettes to convenience stores on Long Island. According to the Institute for Justice’s definitive report on the IRS’s application of the structuring laws, Seize First, Question Later, the IRS seized more than $242.6 million under the structuring laws in more than 2,500 cases between 2005 and 2012. At least a third of those seizures involved no allegations of criminal activity beyond the mere act of engaging in sub-$10,000 cash transactions. Connecticut is a hotbed for structuring-based seizures by federal agents and prosecutors according to data provided by the IRS in response to a public records request. Connecticut is the seventh worst state for structuring seizures. From 2005-2013, federal prosecutors in Connecticut approved 9.2 seizures for suspected structuring for every 10,000 businesses in the state, a rate above most other states. When the IRS seized the bakery’s bank account, it initially appeared that the IRS was going to seek to take the money using civil forfeiture. On June 12, 2013, the IRS sent notice to the Vocaturas that the agency had commenced civil administrative forfeiture proceedings against the property. If the Vocaturas did not file a claim to the money within 30 days, the money would be automatically forfeited to the government. The Vocaturas retained a lawyer in the aftermath of the seizure, still hoping that it would be possible to convince the government to return the seized funds, and submitted the required claim to the IRS to preserve their property rights. The Vocaturas’ lawyer also reached out to Peter Jongbloed, the federal prosecutor assigned to the case, to explain that the Vocaturas were not criminals and to seek the return of the bakery’s bank account. As the Vocaturas’ lawyer sought to negotiate, other similar structuring cases across the country began to attract significant press attention, including a front-page article in the New York Times detailing the cases of IJ clients Carole Hinders and Jeff Hirsch. In response to public outrage, the IRS announced a change of policy in October 2014 under which the IRS would limit seizures and forfeitures under the structuring laws to circumstances where the “structured” funds were obtained illegally, and would no longer pursue “legal source” structuring cases (unless there are “exceptional circumstances”). Then, in February 2015, the Commissioner of the IRS appeared before a congressional committee and apologized for the agency’s overly-aggressive application of the structuring laws. In the wake of these developments, it appeared that the government had lost interest in the Vocaturas. For about a year, the Vocaturas heard nothing from the government—although the government continued (without any apparent legal justification) to hold the funds seized from the bakery’s bank account. Then, on February 18, 2016, the government once again contacted the Vocaturas. Now, seemingly as a response to public criticism of the government’s use of civil forfeiture, the government was asking the Vocaturas to consent to criminal forfeiture. On February 18, 2016, the government sent David and Larry proposed plea agreements, under which the brothers would plead guilty to criminal structuring charges and consent to significant forfeitures and jail time. Under the plea agreements, as penalty for these deposits, David and Larry would have consented to the forfeiture of the approximately $68,000 seized from the bakery’s account; consented to the forfeiture of an additional approximately $160,000 in combined personal assets; and stipulated to a sentencing range of 37 to 46 months imprisonment and a criminal fine of anything between $15,000 to $150,000 each. Under the agreements, they also would have waived their constitutional right to indictment by a grand jury, as well as their right to make a constitutional challenge to the forfeiture. Despite this implicit threat of even heavier sanctions, David and Larry rejected the proposed plea agreements. David and Larry do not believe that they have done anything wrong, and they do not see why they should have to go to jail or agree to forfeit their hard-earned income. One might have thought that, after David and Larry rejected the proposed pleas in April 2016, the prosecutor overseeing the case would seek to move forward with his threatened criminal structuring prosecution. But that did not happen. Instead, on May 10, 2016, the prosecutor served Vocatura’s Bakery with a wildly overbroad grand jury subpoena that demands that the Vocaturas turn over eight-years-worth of financial records, including every business document during that time frame, so that the government can launch a new investigation into the business’s tax and regulatory compliance. With this subpoena, the government has launched a brand new fishing expedition designed to justify the seizure of the money over three years ago and to pressure the Vocaturas to give up the seized money. This retaliatory use of a grand jury subpoena is abusive and highly improper: The Vocaturas are having nearly every aspect of their business placed under the microscope by the IRS because they tried to get their money back and refused the government’s plea deal. The government’s subpoena—seeking every document generated by a business over an eight year period—is precisely the type of “general warrant” the Fourth Amendment was designed to prevent. The Vocaturas are prepared to go through the government’s threatened investigation. They run an honest business: They follow the rules, pay what they owe in taxes and avoid any kind of trouble. But the fact remains that the kind of investigation threatened by the IRS would be a highly effective threat for virtually any small business. Due to unchecked overcriminalization, there are many vague and overbroad federal criminal laws on the books which do not require prosecutors to show any intent to commit criminal acts. Thus, once the full force of the federal government is focused on investigating every aspect of any small business or individual, there is a high risk that investigators and prosecutors will be able to conjure criminal charges even against typical law-abiding people. As civil liberties attorney Harvey Silverglate explains in his book, Three Felonies A Day: How the Feds Target the Innocent, the average American is estimated to commit an average of three federal felonies a day without even knowing it. For example, federal laws on wiretapping, mail/wire fraud and securities are often badly outdated and written so broadly that many people could be prosecuted for completely innocuous behavior…if federal prosecutors chose to focus their attention on them. Federal overcriminalization creates a troubling world where every American is at the mercy of federal investigators and prosecutors. For this reason, the mere threat of a wide-reaching criminal investigation is very effective for pressuring even law-abiding people to cooperate with prosecutors. IJ’s motion for return of property is filed on behalf of Vocatura’s Bakery, Inc., the legal owner of the seized property, and the plaintiff in this case, against the Internal Revenue Services, the Commissioner of Internal Revenue, the Attorney General of the United States, and the United States government, the defendants in this case. IJ’s legal theory is quite simple: The IRS has held onto Vocatura’s Bakery’s money for far too long to initiate a civil forfeiture action and is required to return the money under both the federal civil forfeiture statute and the U.S. Constitution. IJ is filing an action on behalf of Vocatura’s Bakery challenging the government’s “seize first, question later” approach to this litigation and demanding that the $68,000 be promptly returned. IJ’s motion for return of property makes clear that the IRS must return the seized money to Vocatura’s Bakery for two reasons. First, the government has exceeded the deadlines for forfeiture actions set by Congress in the Civil Asset Forfeiture Reform Act of 2000 (“CAFRA”), which gives the government 90 days to initiate forfeiture proceedings or return the property after a property owner has filed a claim for the property. Second, the government has waited so long to file an action that allowing a forfeiture action to go forward after such an excessive delay would violate the Due Process Clause of the Fifth Amendment to the United States Constitution. Because any forfeiture action would be untimely, there is no conceivable purpose to the government’s continued possession of the funds and therefore they must be returned. Under policy changes adopted by the IRS in October 2014 and DOJ in March 2015, the government would not even have seized the bank account of Vocatura’s Bakery. The Vocaturas are not criminals—they are legitimate, hard-working business owners. They are exactly the kinds of people the government’s policy change was intended to protect. However, because the IRS took their money before these policy changes were adopted, the policy changes have done nothing to help the Vocaturas. Importantly, the federal prosecutor and the IRS have continued to aggressively pursue this case even after these policy changes, continuing to attempt to forfeit the money by pressuring the Vocaturas to sign plea deals based on alleged structuring of the bakery’s banking deposits. This case is an example of a particularly pernicious strategy of threatening civil forfeiture victims with criminal prosecutions in order to get them to give up the money. This highly aggressive tactic has been used by prosecutors across the country, at the state and federal levels, from Muskogee County, Oklahoma, to Frederick County, Maryland to Tenaha, Texas. In each of these locations, and in many others, prosecutors attempt to pressure property owners to agree to let their property be forfeited by threatening criminal prosecution, and in some cases, even filing criminal charges. In April 2016, the Muskogee County, Oklahoma District Attorney’s office charged Dallas resident Eh Wah with felony possession of drug proceeds a little over a month after the Muskogee County Sheriff’s Department seized over $53,000 from Eh Wah in a highway stop (but found no drugs or contraband) in late February 2016. The Muskogee Sheriff’s deputies refused to believe Eh Wah’s explanation that he was the U.S. tour manager for a Burmese Christian rock band, and that the money was proceeds from ticket sales and donations that they were raising for charity, despite visiting the band’s website, looking at pictures of the tour on Eh Wah’s phone and a mountain of corroborating documents in his car, and talking with the band’s leader on the phone. But once The Washington Post ran a feature story about the incident announcing that the Institute for Justice was representing Eh Wah, the Muskogee County DA’s Office dropped the criminal charge and the civil forfeiture proceeding later that same day and immediately returned all of the seized money. If not for the publicity and IJ’s pro bono representation, the criminal charge and the civil forfeiture proceeding would still be pending. Randy agreed to give up half his money. Although he had done nothing wrong, Randy felt he had no choice but to take the deal. In Tenaha, Texas, the county’s district attorney frequently threatened out-of-town drivers with trumped-up felony charges such as child endangerment and money laundering in order to get them to agree to surrender their money and other valuables in what were known as “cash-for-freedom deals,” as detailed in Sarah Stillman’s award-winning feature, “Taken,” in The New Yorker. How big is the problem of IRS seizures and forfeitures based on structuring? In Seize First, Question Later, the Institute for Justice used data obtained through FOIA to document IRS seizures from 2005 to 2012, finding more than $242.6 million was seized under the structuring laws in more than 2,500 cases during that time period. 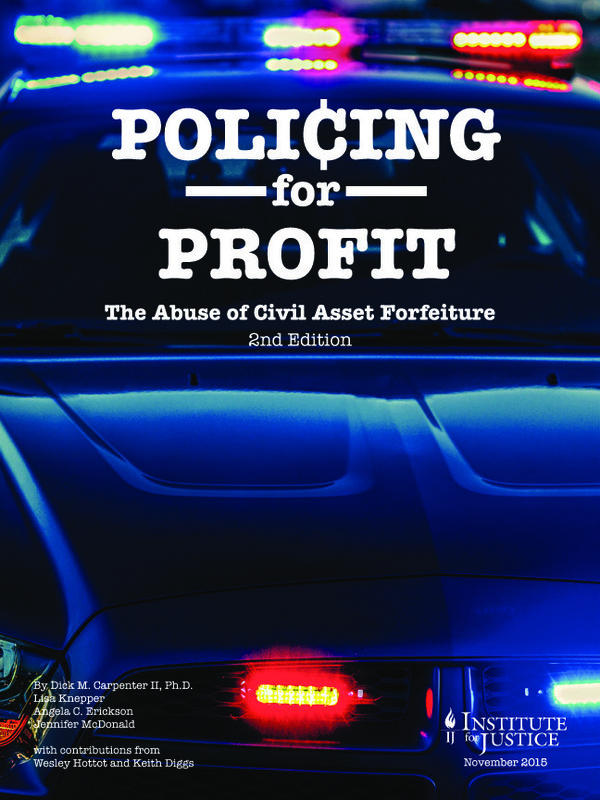 In order to update and expand the information in Seize First, Question Later, the Institute for Justice has subsequently sought the release of the IRS’s entire seizure and forfeiture database, the Asset Forfeiture Tracking and Retrieval (AFTRAK) system. Unfortunately, the IRS now refuses to release these records unless IJ pays over $750,000 in “costs,” because the IRS wrongly considers IJ to be a “commercial use” requester, even though IJ is a 501(c)(3) nonprofit under the Internal Revenue Code. In fact, IJ has previously published several reports on forfeiture based on data obtained through FOIA, including Seize First, Question Later, all of which are made available to the public for free on IJ’s website. At the same time it refuses to release its own records, the IRS is demanding that Vocatura’s Bakery turn over eight years of records in response to an incredibly broad grand jury subpoena. This case is being litigated by IJ Attorneys Robert Everett Johnson and Dan Alban. Serving as local counsel will be Ross H. Garber of Shipman & Goodwin LLP. The Institute for Justice is the national law firm for liberty and the nation’s leading advocate for property rights. This case is the latest in IJ’s nationwide initiative to end civil forfeiture. IJ has fought civil forfeiture on behalf of the owners of the Motel Caswell in Massachusetts, the owners of Schott’s Market and Metro Marathon service station in Michigan, the owner of a truck seized in Texas, the owner of a restaurant in Iowa, a North Carolina convenience-store owner, a distribution business on Long Island, and a college student in Kentucky. IJ exposed the IRS’s abuse of structuring laws in Seize First, Question Later: The IRS and Civil Forfeiture. For more information on IJ’s national initiative to end civil forfeiture, visit endforfeiture.com.